I’m still here, and I’m knitting again. Seriously. But the weather has been so bad that I haven’t got any good pictures of my work. 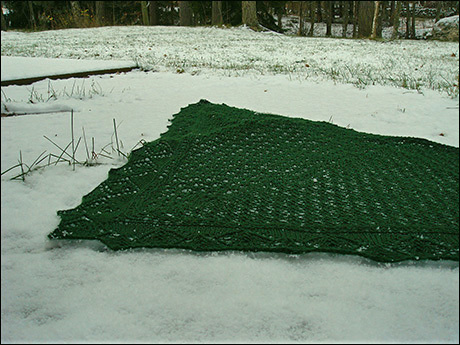 I have started, and finished Ene’s shawl from Scarf style, it is blocked, and today, finally, I got some kind of pictures of it. I hope I’ll get modeled pictures taken during the weekend. 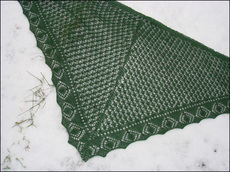 The shawl is knitted on 3,75 mm Addis with the wonderful yarn Sivilla by Wetterhoff. I spent a wonderful weekend with a friend at her summer cottage the days before Ludde arrived (you know, girl talk until 2 am, good food, wine and chocolate, too little sleep and fabulous weather). On the way home we stopped by at Wetterhoff in Hämenlinna, and I bought some yarn, three skeins of Sivilla in this green colour and three in a purple colour. Sivilla is 70 % merino wool and 30 % silk, and there’s 250 m to 50 grams. This is the first time I’m knitting a shawl starting from the two shorter sides and decreasing until there are only the upper border stitches left. Pretty interesting way to make up a shawl, if you ask me. The beginning felt like knitting in a black hole (like the last rows when you start with a few stitches and increases), but when the border was made, it went pretty fast forward. I’m also about to cast on for an other pair of mittens, in Rauma Finull and Röros. Stay tuned for what will turn up. 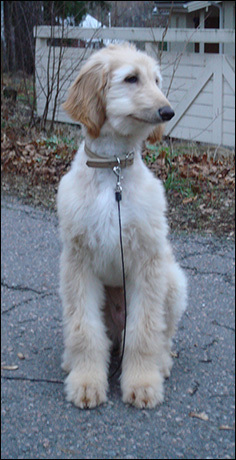 And here is an updated picture of Ludde, the Afghan hound puppy, new washed and fluffy. Doesn’t he look pleased with himself? He has added 5 kg to his weight since he came to us, and height quite much too. I didn’t measure him when he came, but now he’s 54 cm over the shoulders. And he has five new teeth. I know, I sound like a mother talking about her newborn. I’ll try to stop.